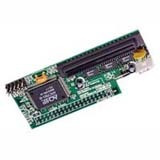 The AEC-7720U Ultra SCSI-IDE bridge is a dedicated bridge to connect IDE (Integrated Device Electronics ) devices to an SCSI interface. With ACARD micro-controller core built-in, it provides more flexibility and stability for highly demanding applications. The AEC-7720U supports IDE ATAPI devices such as CD-ROM, CD-R/RW, DVD-ROM which can be easily attached to the SCSI bus. The ACARD Ultra Wide SCSI-IDE bridge is a dedicated conversion kit which converts the low cost / high performance ATA devices to high performance SCSI (Small Computer System Interface). The ACARD SCSI-IDE bridge has no disk capacity limitation, user can install a 160 GB hard disk or even higher capacity in the future. A general purpose SCSI-to-IDE device converter. If you need a bridge adapter for UW-SCSI to SATA, please have a look at the AEC-7730A.